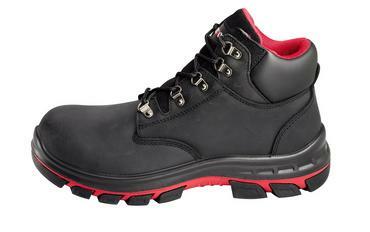 Waxy black water resistant full grain leather upper. Five pairs of metal lace loops provide quick release lacing . Moisture wicking sandwich mesh lining. Replaceable, full length 10mm heel cushioned foot bed for extra comfort. Steel toe cap resistant to 200 Joules impact. 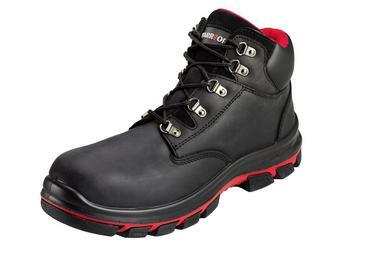 Stainless steel midsole for penetration resistance protection to 1100 newtons. Dual density polyurethane / rubber sole. Outer sole is of hard density rubber.